In 2014 local volunteers and the Parish Council put together a Steering Group to draft a Neighbourhood Development Plan (NDP) for Cam, under powers provided by the Localism Act 2011. This will enable Cam to put in place planning policies for the future development and growth of our neighbourhoods. If you are a Cam resident, please feel free to get involved. The plan can be as detailed or as general as local people want. Neighbourhood Plans empower local people to get the right type of development for their community, but the plans must still meet the needs of the wider area and will have to take into account the Local Plan produced by Stroud District Council on the assessment of housing and other development needs in the area. The influence a Neighbourhood Plan gives the community means it is worth getting involved! Cam Neighbourhood Plan, when it is completed, will be subject to examination and referendum by the people of Cam. If approved and supported by a majority of residents the plan will be adopted by Stroud District Council and become a statutory document to aid when developers/residents are looking at your parish for future development. To find out more please email or call 01453 548884. Our NDP document Is going through the layout stage for presentation to Cam Parish Council then to Stroud District Council and the public. You should be able to see a copy on this site at the end of April. Great progress as the NDP Village Design Statement is in its final consultation draft and approved by Cam Parish Council. An independent Landscape assessment has also been received. The NDP group has also completed a public consultation process on Local Green Spaces as well has organising 6 open events about the NDP in general from August 2018 to February 2019. A Design Code Workshop was held to continue the work that started last year looking at some of the emerging Design Code material focussing on 'The Essential Cam' and this time on the 'centre' of Cam Village (as defined in the Design Statement). We explored issues and opportunities with the workshop attendees to inform a part of the Design Code that will be addressing how this area can have a distinct sense of place that contributes to the identity of the wider village. Our Green Infrastructure report is completed. Best News of all - we now have a draft NDP! This is being circulated for comments by the group and the Council. Cam's Village Design Statement for use by Developers, Planners, Builders and all interested parties. We look forward to seeing you and there is coffee, tea, and biscuits! Find out what's happening in Cam and tell us what you think! Let's talk about housing, green spaces, the Future... ... let's talk about CAM! The steering group is now at the stage where it is working with and getting guidance from a group of expert consultants to ensure that our Neighbourhood Development Plan meets the professional standards required of it. As a result of this and an injection of 4 new and enthusiastic volunteers to the group, progress has really taken on a pace. The Design Statement is completed and being reviewed. This involved a lot of hard work by our volunteers and Councillors who walked every inch of Cam area by area and submitted their findings towards this important document that will feed into the NDP. Next on the Agenda is a Landscape Assessment that will be carried out by a consultant and which will also inform the NDP. And the hope is that the Neighbourhood Plan will be complete by the end of the year! This month the steering group is preparing to create a "Design Area Statement" (DAS) or put another way "A Character Assessment" of Cam, which is an essential requirement for a Neighbourhood Plan. To arrive at our DAS our members are undertaking a survey of the whole of Cam area by area to identify the essential character of the those areas and of the village as a whole. The DAS is important because it allows us to have influence on future development in the area and to ensure it is keeping with the character we have and want to have. We want any new development (and we already know there is outline planning applications for north east Cam, Box Road, for 450 to 650 houses) to fit in with our village and to protect its essential character. If we do not have a comprehensive DAS, we could end up with styles of housing we would rather not have or that are out of character like houses in a line, no front lawn and the road used as the car park. Cam's streets are lined with trees, shrubs and foliage and our village is surrounded by woods and open fields. We have a tree sky line classed as an Area of Natural Outstanding Beauty (ANOB). We want to preserve these special features. 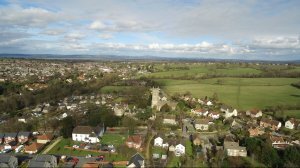 In this report we will be aiming to protect the rural feel and essential character of Cam by first identifying what makes it this way in detail and then by stating what new development might look like in order to fit in with this without disrupting important views, for example, that are so distinctive of our village. We can also identify features within applications that we would reject as not appropriate or in keeping. USE:​​ What buildings and spaces are and could be used for. LAYOUT:​ How the buildings and public or private spaces are and could be arranged, the ​​​relationship between them and the buildings and spaces around them. We would also seek to support and identify land appropriate for those who want to build their own homes. Should you want to get involved with the Steering group, please contact the Deputy Clerk at Cam Parish Council.